Welcome to the Thompson's Prawn Farm website! North Carolina's own freshwater prawn producer. 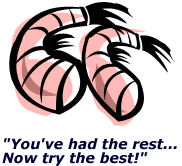 We're a licensed aquaculture provider, specializing in jumbo freshwater prawns. Prawns are a healthy source of nutrition and taste great! Go to our "Prawns" section to find out more information about the freshwater prawns we raise at Thompson Farms. This year we will harvest on Friday, September 28th, 2018.... Please come out and join us!